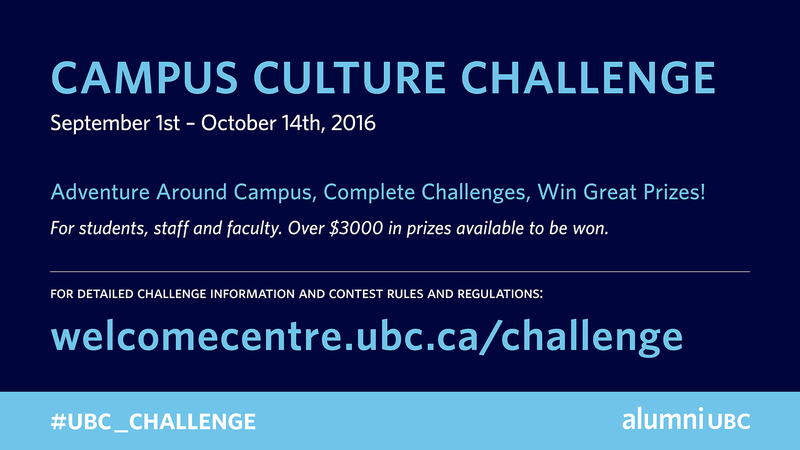 Take part in the UBC Welcome Centre Campus Culture Challenge from September 1st to October 14th. Adventure around campus, complete challenges, and win great prizes! At the Irving K. Barber Learning Centre, come in to the 2nd floor foyer and take a photo of any of the display cases from the current exhibit Mexiquense Popular Art and tweet it with the hashtag #IKBLC. Take it to the Robert H. Lee Alumni Centre for your stamp! View the information sheet below or download the passport here. 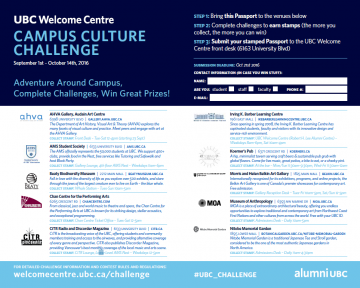 Participants must then go to the UBC Welcome Centre (Robert H. Lee Alumni Centre) to have their challenge verified to receive their stamp. Staff will confirm that the challenge has been completed. Who can complete the challenge? This contest is open to current UBC students, staff, and faculty (valid UBC ID is required when submitting your stamped passport). Other individuals are welcome to complete the passport, but will not be entered into the draws. Only one submitted passport per individual. How do you collect stamps? 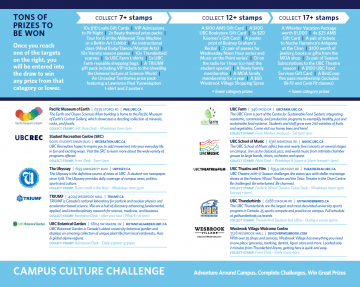 Stamps can be collected by completing the associated challenge at participating venues between September 1st and October 14th. Collect your stamps at the locations and times noted in the venue descriptions. You must prove that you completed the challenge to get the stamp (usually this means showing your social media post on your phone). Note: stamps for the Irving K. Barber Learning Centre and for the Under 19 Koerner’s Pub can be collected at the UBC Welcome Centre. How do the prizes work? The Grand prize draw will include all eligible booklets that contain 17 or more stamps, the second draw will include all eligible booklets that contain 12 or more stamps (including those who did not win in the first draw), the third draw will include all eligible booklets that contain 7 or more stamps (including those who did not win in the first and second draws). The draws will only contain eligible booklets that are received before 6pm, Oct. 21st at the UBC Welcome Centre, 1st Floor Welcome Desk, 6163 University Boulevard, Vancouver BC, V6T 1Z1. Any additional costs or expenses incurred redeeming the prize(s) that are not specifically covered by the prize are the responsibility of the winners. None of the participating venues, UBC, alumni UBC, prize contributors or their respective agents or representatives shall be responsible in any way for the use of or bear any liability whatsoever in any way attributable to a prize awarded in the contest. I still have a question. Can you help me? For any questions or clarifications, please contact the UBC Welcome Centre front desk at 604-822-3313, alumni.ubc@ubc.ca or in person at the Robert H. Lee Alumni Centre.